Come and join us on November 8th 2016 at Middleport Pottery in Longport (near Stoke-on-Trent) to find out about using genre as pedagogcial resource. The first in a series of Writing-PAD events this academic year focusing on genre(s), this day introduces a theoretical framework for exploring genres and their affordances, including a recent example of how this can work as pedagogical practice. Via a tour of this very special venue, we will not only explore a valued English Heritage site, but also use this as a starting point for playing with the idea of genre and regenring in our own teaching practices. The day will also include the launch of the recently published book Writing Essays by Pictures by Alke Groppel-Wegener. Cost £145 : Includes the whole day, with refreshments on arrival and in the afternoon, a delicious buffet lunch, a special tour of the venue and your own copy of Writing Essays by Pictures. 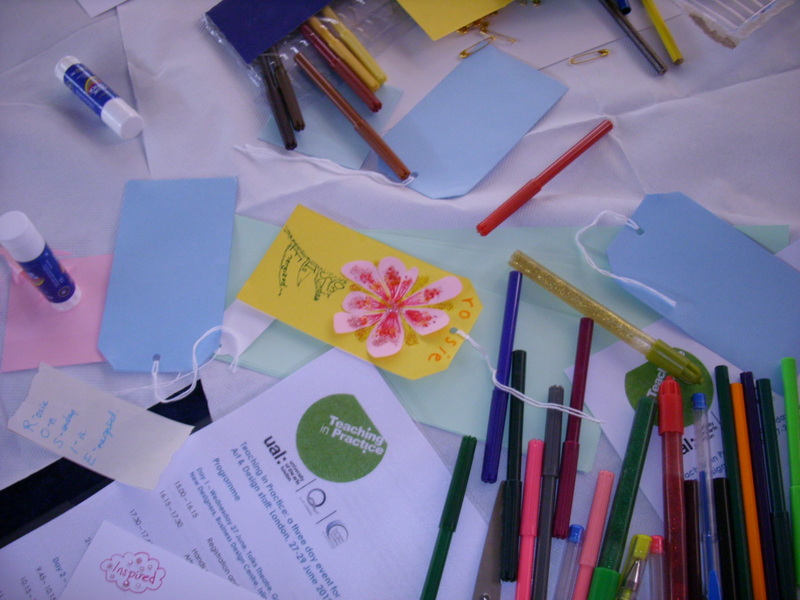 Let’s start the day as we mean to continue by making our own name-tags – regenring a tiny part of conference/symposium tradition into something more expressive. Fiona introduces a theory that could frame genre as pedagogical resource, updating thoughts from her book Student Writing and Genre. Alke shares the story of the development of her recently published book Writing Essays by Pictures, an example of regenring the traditional study skills textbook into a picture/work-book. Explore Middleport Pottery via a special tour and then use this experience to start thinking about ways of genring teaching practices. Fiona and Alke start us off using the Writing Essays by Picture books as an example to explore gains and losses of this particular regenring process to demonstrate an example of using the theoretical framework established at the beginning of the day. We will then move into the discussion of the outcomes of your genring activities. Dr Fiona English is Honorary Senior Research Associate at UCL Institute of Education with a background in linguistics and language and literacies in education. Much of her research has been concerned with student writing and academic literacies, with her book Student Writing and Genre using a social semiotic perspective to explore the relationship between genre and the production of academic knowledge. More recently she has published Why do Linguistics? : Reflective Linguistics and the Study of Language with Tim Marr. Dr Alke Groppel-Wegener is Associate Professor of Creative Academic Practice at Staffordshire University and a National Teaching Fellow. Having trained as a theatre designer but ending up teaching study skills, she became frustrated with the traditional ways of teaching academic practice, which has led her to develop her own approach being inspired by the creative processes of art and design and collated her strategies as Writing Essays by Pictures: A Workbook for students. She blogs at www.tactileacademia.com. Middleport Pottery is home to Burleigh Ware, which is still made on site using traditional craftsmanship. (And there is a shop where you can get your own Burleigh Ware, too). It was restored with the help of the Princes Regeneration Trust, has become a top visitor attraction and the home of The Great Pottery Throwdown. It is a short walk from Longport Train Station, a 5 minute train ride from Stoke-on-Trent, and we would encourage participants to use public transport. Please note that this is an old site and some of the areas are cobbled and might present a problem for people with mobility issues. It is advised that you wear sturdy shoes (no high heels) for the tour, and that you let the organiser know of mobility issues in advance, so that she can discuss your needs. This exploratory workshop is the first in a series that will stretch through the academic year and culminate in a special issue of the Journal of Writing in Creative Practice. Through discussion within the Writing PAD community, we know that very often lecturers, and particularly practitioner/teachers, are doing a lot of interesting things in their teaching, but they seem to lack the confidence to share this work, specifically within the academic conventions of publication beyond a description of what they are doing. To address this, we have decided to pick the focus of Genre, Genring and Regenring for this academic year, and are organising a series of events that will provide support for this issue and culminate in one (or possibly two) special issues of the Journal of Writing in Creative Practice, guest edited by Fiona English and Alke Groppel-Wegener. a first follow-up in February 2017 which explores the traditions and conventions of academic writing. There will be speakers in the morning, which are still to be confirmed, but we are talking to Julia Molinari, Lisa Clughen and Julia Lockheart, who will explore academic writing as a genre – and discuss the changes it is going through. The afternoon will be given over to a sharing session/exhibition where delegates have the opportunity to show off examples of their genre-ing and regenring practice, either as artefacts or in a poster format. The will allow the opportunity for people to share best practice, but also to get feedback and ideas for potential research designs in order to explore their practice more and on a more theoretical level. This event will probably be held at De Montford University in Leicester. A second follow-up in the form of an academic conference, either at Easter time or early May 2017. Here people can share their practice in an academic format, and those presentations could use the feedback from the conference to inform papers for the Special Journal edition. This might be hosted at Nottingham Trent University or Staffordshire University. If there is interest, there are plans for a writing retreat to facilitate the writing of the papers, possibly at Nottingham Trent University. We are currently investigating funding to keep costs down, but it might be the case that we need to break even on this. You will not have to attend all these events to be considered for the special issue, but as we are trying to build up a mutually supporting network, it would be nice if you could come and join us at as many as possible. As the people who have come to my workshops know, I have gotten into the habit of making and giving out little booklets. I call them ‘tactile academia books’ (which sounds a bit grand), and I thought it was high time to post a few details about them. I thought I would start with The Land- and Seascape of Creative Practice. This wasn’t the first one I did, but it was based on an idea that I had a long time ago and on a concept I have been using to explain what I do for quite some time. And in a way it explains my take on academic and creative practice – and the relationship between them. When I started teaching at uni, I joined an Art & Design department as an academic looking after the first year study skills provision. Very much a Writing in the Disciplines approach, I was tasked with running modules that would teach studio-based art, design and media students how to research and write for an academic essay. And I found myself quite often in the position of having to explain to other colleagues how what I did fit into the individual programmes, and how it did work that my students ranged from 3D Design to Animation, from Fine Art to Film Production. 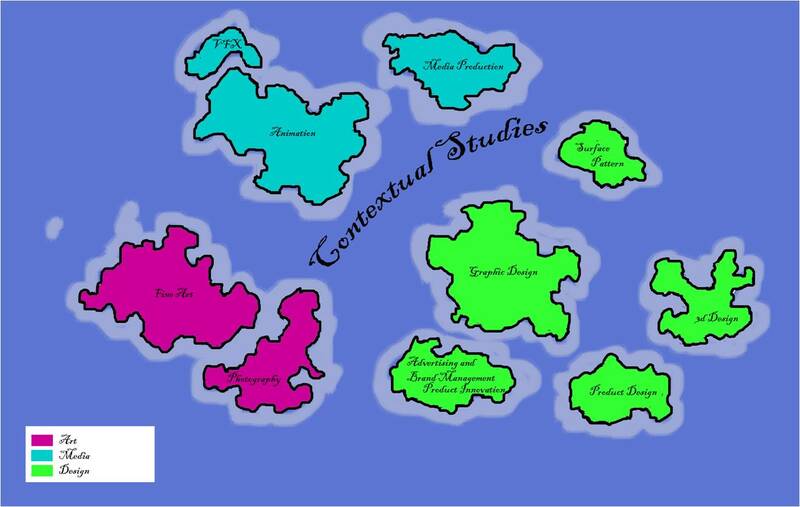 What I started using was the image of islands, each representing a separate discipline, but each connected in a way through an ocean, that could be seen as ‘Contextual Studies’ (the historical and theoretical stuff that is somehow outside of the making). While it is, like any visual analogy, a fairly simplified model, I think this shows the relationship between the realm of the tangible outcome, the islands, on the one hand, and the more theoretical thinking, the ocean, on the other. (The Study Skills bit I always thought of as somewhere in the shallows around the islands, linking the practical and the theoretical approach to a specific discipline.) It also made me think about the ntaure of words as an outcome, which can be a bit like water: they can be shallow or deep, they can be watered down, but above all they are fluid. This image stayed with me and when I encountered Artist’s Books and thought I might be interested in making some myself, I used this as the starting point of my first foray into screen printing, making an accordion fold book called Contours. The idea was that it would show a part of that initial map idea, but visualise the thinking in more detail. So the island bit used images – pictures of finished artefacts inland, then images of word in progress, maquettes, and finally sketches where it came to the ‘beach’ – while the ocean bit used words – hand-written notes in the shallows, then artists statements and more and more theoretical (and later on abstract) texts on craft. While Contours is a plan view, I always wanted to make a sort of elevation, because that would visualise the idea of shallows and depth more. It took me a while to find the right technique, but last year I was on a printing course where we made scratch negatives, which can result in printing plates, which are very fine and detailed, almost like engravings, and here I was able to make this image, which I think shows the land- and seascape of creative practice. 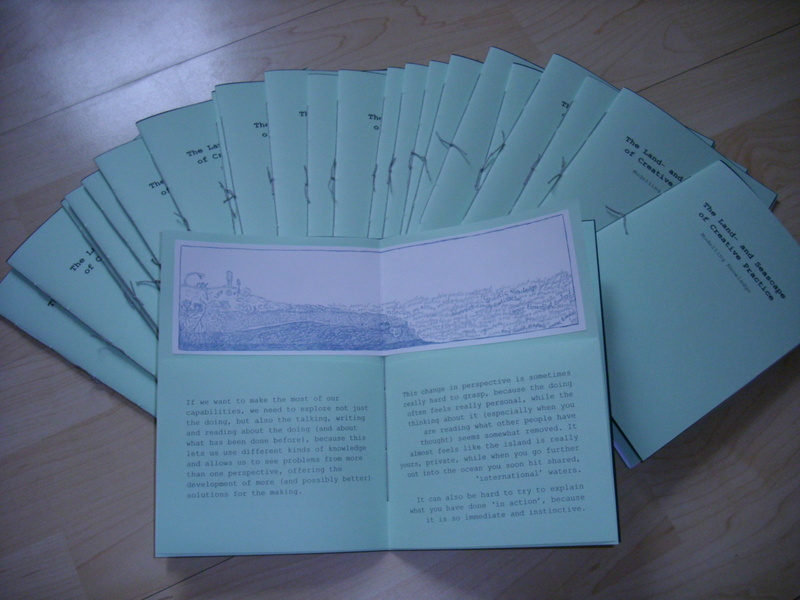 This print has become the centrepiece of this particular booklet, The Land- and Seascape of Creative Practice. Subtitled ‘Modelling Knowledge’ it aims to explain the relationship between creative practice and theoretical thinking – and does so by not just introducing the islands analogy, but also mapping Donald Schon’s notion of reflective practice and Michael Biggs’ differentiation of experiential feeling and experiential knowledge onto it. it aims to make the point that there is a synergy between the making and the theory – and that it is useful (if not crucial) to be able to engage with both for the best results in either. On 17th December 2012 the University of Northampton will host a workshop in the Writing in Creative Practice series, which is run in conjunction with Writing PAD and funded by the Higher Education Academy. Titled Practicing Theory in Art & Design Education, this workshop (Programme Practicing Theory) will explore ways to build and strengthen the relationship between theoretical modules of study and studio-based learning within HE art and design courses. A downside of the modular nature of HE delivery is that the various taught elements within a programme of study can appear to be ‘stand alone’ with little or no connectivity between other areas of the student learning experience. This separation can be found in the institution that is the undergraduate essay. Whilst formal written assignments that draw together hypothesis, research, analysis, method and execution are excellent ways to investigate and underpin learning, for students they do all too often appear to be a dry and perfunctory task that bears little relation to other areas of study. Within the context of art and design education too often the perception is that the ‘creative stuff’ happens in the studio and workshop, whereas text is just something one is required to do, regardless. The challenge for HE educators is to breakdown perceived divisions in order to match ‘creative expectation’ within all areas of art and design undergraduate study. To this end the Writing In Creative Practice: Practicing Theory In Art & Design Education event will bring together colleagues from Northampton and from other institutions to consider ways, through workshop activities, conference papers and discussion, by which theoretical studies and studio practice can be effectively integrated in order to emphasise simply creativity and build a more holistic notion of ‘practice’ for students. 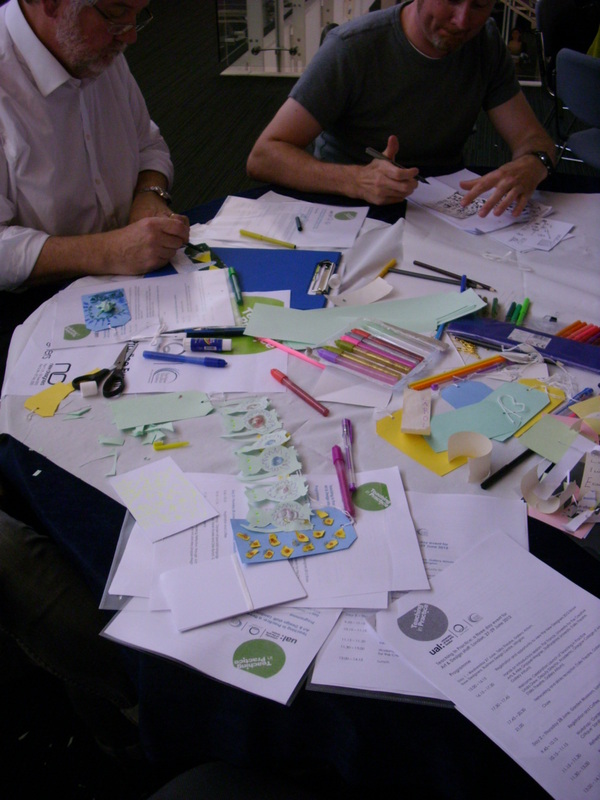 At the end of June I went to the Teaching in Practice event, which was three days of Art and Design teaching staff getting together at different venues to network and talk about teaching in practice. Myself and Pat Francis had been invited to do two sessions, one on the first day as an ice-breaker and one on the second day to particularly get people thinking about the reflection-THROUGH-action that making provides. The first day was hosted at the New Designers 2012 exhibition, so we had the chance to see the show as well, and included a welcome by Linda Drew celebrating the launch of the Teaching in Practice event, which will hopefully become a regular feature on the HEA calendar. Day two was taking place at the Garden Museum, a fabulous space (with some very nice food), particularly as we were lucky with the weather so the first workshop in the morning, Garden of specialist language: Ars cesura vs. art Critique led by Sarah Rowles and Giles Bunch of Q-Art, actually let us take over the garden as we explored ways of presenting work and the ‘crit’ that is often so important in teaching studio-based disciplines. The keynote after lunch was given by Professor Juan Cruz, the director of the Liverpool School of Art and Design at Liverpool John Morres University. It was titled ‘Hunting in Packs’ and can be seen here (plus a video montage of the whole event). The last workshop of the day was facilitated by Ellen Sims and Kirsten Hardy, and was exploring the UK Professional Standards Framework for teaching and supporting learning. There were some insightful discussions of the new HEA framework re the new different stages of fellowship – and why we should try to get accredited! Day three was held at the Sackler Centre at the Victoria & Albert Museum. We were treated to two keynotes, one by Mark Craweley, the director of Widening Participation and Student Progression at the University of the Arts, London with painter, educator and curator Kimathi Donkor, the other by Leanne Manfredi, the programme manager responsible for Higher Education and Creative Industries at the V&A. After a refreshment break James Corazzo, Senior Lecturer in Graphic Design at the University of Derby, led a workshop intriguingly titles ‘Teach less, Learn More?’ in which he explored ways of actively engaging students by making them get out there are try stuff rather than read or hear about it and stick to the drawing board. The evening ended with the opportunity to networ as well as visiting the British Design 1948-2012: Innovation in the Modern Age exhibition at the V&A, as well as enjoying the Friday Late at the V&A event Un-built, which explored the interplay between architacture and the visual arts. By the end of it I was exhausted, but I hope that it’ll be repeated next year so I can do it again! I also came home with a stack of postcards to myself (plus the feedback mentioned above), but that might be a later post.